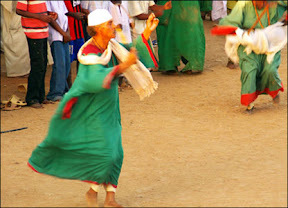 SUDAN WATCH: Sudanese music & "whirling dervishes"
Sudanese music & "whirling dervishes"
SUDAN'S "whirling dervishes" are famed throughout the world for their spell-binding dances, in which they are accompanied by rhythmic drumming, as they gradually work themselves into a trance. Dervishes are Muslim devotees. Popular music has had a rather chequered history in recent years, with many artists becoming exiles after the government stamped down on their freedom to perform. Lyrics are all-important in Sudanese music, with new words often made up on the spot for a special occasion such as a wedding. Traditional instruments include tom-toms, rababas (viol-like stringed instruments with a hide-covered body), and the oud (a lute). The weekly dervish ceremony near the capital, Khartoum, is considered one of Sudan's main tourist attractions, explains BBC News website reader Mohamed El Hebeishy. Sufism is associated with both Sunni & Shia Islam. Those who practice it are called Sufis, or Dervishes. Every Friday dervishes gather an hour before sunset around some of the big mosques in Khartoum and Omdurman. A circle is formed and the ritual begins. The ceremony starts with the Madeeh - chanting words of gratitude to the Prophet Mohammed. The audience interacts with the chanters, dancing to the rhythms of the percussion instruments. Then comes the Zikr, in which the dervishes repeat the word 'Allah' many times. The dervishes start whirling around inside the circle. With the music, the fragrance of burning frankincense, the endless repetition of religious chants, and the dizziness, they go into a state of trance. According to ancient belief, Sufism is about the purification of the soul in pursuit of inner peace. The whirling dance came from the Mevlevi Order in Turkey, and is just one of the physical methods used to try to reach religious ecstasy. 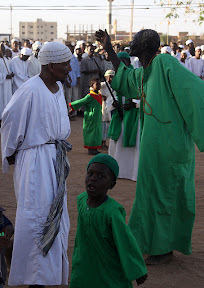 While the more well known Mevlevi dervishes wear white robes, Sudanese dervishes are often dressed in green and red. Sufism started in Baghdad, and spread to Persia, India, north Africa, and Spain. Another feature of the Sudanese dervish is the wearing of beads. 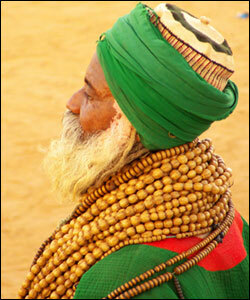 The dervish elder pictured here has 1,000 beads wrapped around his neck — quite a weight to carry. 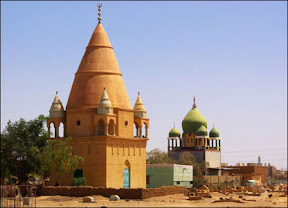 The Sufi order known as Tariqa, Qadiriyyah is one of the most widespread in Sudan & north Africa. It was established by Abdul Qadir Jilani (1077-1166 AD), a native of the Iranian province of Gilan. This mausoleum in Omdurman belongs to one of 19th century Qadiriyyah leaders, Hamad Al Nil. The ceremony is not all about devotional chanting, it is also a social and communal gathering where food is served for the needy. Growing hair is a common practice among the dervishes, some keep it in dreadlocks while others just let it loose. Although Sudan is in many ways a male-dominated society, women find themselves a place in the crowd. They gather in one corner wearing bright, colourful robes. At the close of the ceremony, just before sunset, one of the dervishes walks round the gathered audience with frankincense - which is considered to be a type of blessing to the faithful. Sheikh Hamed al-Nil was a 19th-century Sufi leader of the Qadiriyah order, and his tomb is the weekly focus for Omdurman's most exciting sight - the dancing and chanting dervishes. Each Friday afternoon before sunset, adherents of the Qadrriyah order gather to dance and pray, attracting large crowds of observers and participants. The purpose is a ritual called "dhikr". The "dhikr" relies on the recitation of God's names to help create a state of ecstatic abandon in which the adherent's heart can communicate directly with God. This personal communication with God is central to Sufi practices. At the end of the ritual, the dervishes break off and enter the mosque to pray in the orthodox Islamic manner. With Sufism so important to Sudanese Islam, "dhikr" rituals play a major role in religious life.